There’s an empty feeling you get in your stomach when you open your analytics dashboard and see lines plummeting downward. Your sign ups are down, your video plays are down. The last thing you want is a passive aggressive text message from a French bulldog named Turtle, but it might be exactly what you need. Turtle is the Data Watchdog at All Good Text, a product that texts you once a week the three Google Analytics and YouTube metrics that matter most to your organization. 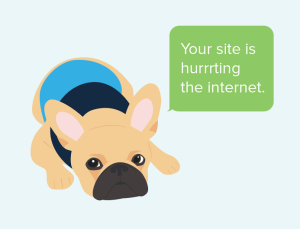 “Your site is hurting the internet, try better next week,” Turtle texts you along with your data. This may seem harsh, but there’s a message behind the Frenchie’s passive aggression. Turtle’s co-creators at All Good Text aim to make data fun and actionable for nonprofits. People often ignore data emails because those reports tend to be robotic and cluttered. All Good Text pairs data with humor to deliver a dose of fun while gently nudging users to check their critical web metrics and iterate, one text at a time. “Some of the most valuable resources at a nonprofit are the organization’s web data. We built All Good Text to equip nonprofits with a Data Watchdog who keeps a leash on their data. Twilio enables us to deliver texts that keep nonprofits abreast of their important metrics,” says Ann Nguyen, co-creator of All Good Text. Nonprofits are lean, mean and working incredibly hard. Employees don’t have time to review pages of reports, or parse through spreadsheets. But, this doesn’t mean that nonprofits should be separated from data. 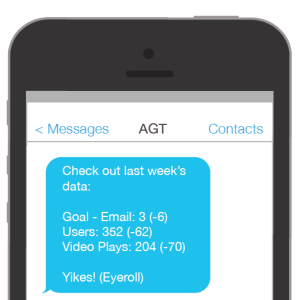 All Good Text is the happy medium that gives busy employees a short and sweet rundown of the metrics they deem important. Unlike emails, text messages get read. Ann is currently reaching out to other nonprofits to help them adopt a data culture. You can learn more about her work by visiting All Good Text.